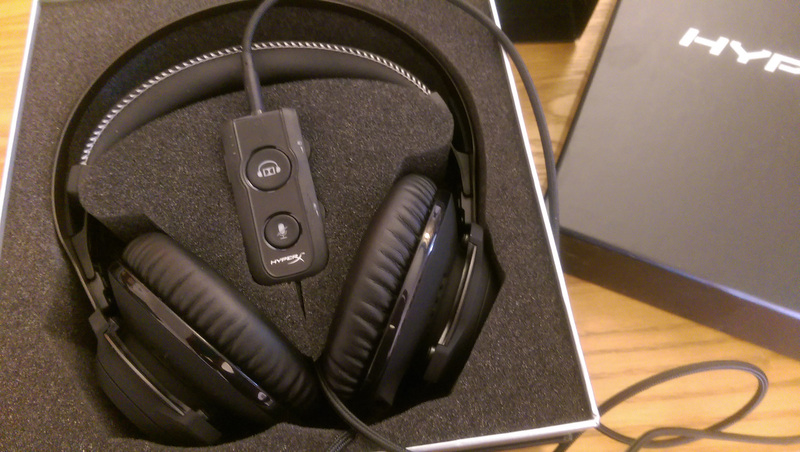 The Revolver S has a solid-steel frame that attaches to two memory-foam earcups. These are the same type of earcups which are used in all HyperX headsets, providing a great mix of support and comfort as when encasing the ear. 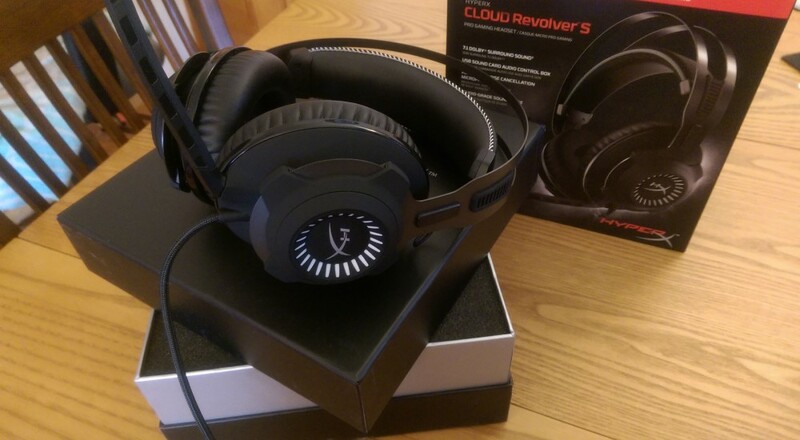 I was pleased with the HyperX earcups when I reviewed the Cloud Stinger before, and my experience with these was much the same. They’re encased in a soft leatherette material that is resistant to staining and won’t pick up lint or absorb sweat like cloth encasements. The suspension band is something a little different than I’ve experienced in previous headsets as it, too, is encased in memory foam and leatherette, housing a plastic band that’s attached to the frame. This plastic band allows the suspension band to expand automatically to the height of your head, avoiding the common method of manually adjusting each side of the headset. At first, I was worried that this would lead to an uncomfortable amount of pressure on the top of my head (I’ve had previous headsets that I’ve had to abandon due to this issue). Fortunately for the Revolver S, that didn’t turn out to be the case. While I do feel the suspension band resting on my head, it’s not uncomfortable or distracting in any way. 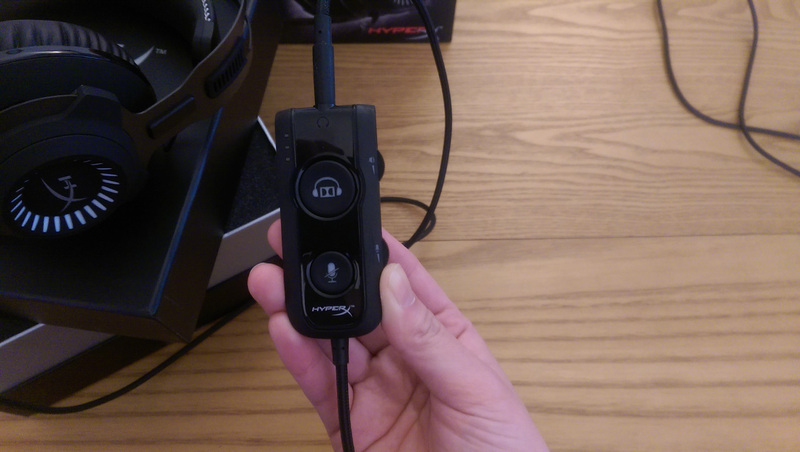 The headset’s three-foot woven cable connects the left earcup to a 4-pole jack, which can either be directly connected to a device (like a console controller) or to one of the two connectors packaged with the headset: a PC extension cable for dual 3.5 stereo/mic jacks or an audio control box ending in a USB connection. Between these three different plugs (4-pole, USB, and dual 3.5mm), the Cloud Revolver S is compatible with PC, Mac, PS4, mobile devices (e.g. phones, tablets), and Xbox One (though an adapter will be required if the Xbox One controller does not have a 4-pole port). This audio control box dongle is where the real audio magic happens. It houses a DSP sound card and takes care of your standard audio needs, replacing the need for cumbersome software. The dongle has dials for audio and mic volume on one side and a button on the front to mute your mic. The other side has a large Equalizer button, where you can switch between three different modes for your audio: Vocals, Flat, and Bass, with three corresponding lights on the front of the dongle. The main feature of the dongle, however, is the large Dolby Surround 7.1 audio button. During my interview with HyperX at PAX East 2017, Mark Tekunoff demonstrated to me how the Revolver S drivers showcase the separation of sounds, especially with the surround sound on. I haven’t cared too terribly much about surround sound in previous headsets, but I can really tell the difference with the Revolver S. It’s been very enjoyable to listen to music with surround sound on because the separation of sounds is very noticeable: picking out treble and bass is easier; they sound more distinct. I’ve even taken to playing some of my games of Overwatch with surround sound on at times. I never really liked playing games with surround sound on before, as it felt distracting and muddled together, but the drivers of this headset don’t feel that way at all. Contrary to my previous experiences of gaming with surround sound, weapon effects sound more differentiated and shots/explosions sound more satisfying. It’s been a great new experience for me.